You’re facing a massive NCLEX study plan crisis – and it’s one that wants to sink your registered nurse test scores to dangerous levels. If you don’t follow the official NCSBN website’s study and test plan (which lists the professional knowledge measured), just that alone is enough to cause failure on your registered nurse exam. An excellent NCLEX RN study guide book and set of practice test questions will closely follow the official content material of this exam. …And your NCLEX RN Study Plan is suffering because of it. You feel weak. Helpless. Completely at the mercy of your registered nurse exams. How can you fight back against information overload when you can’t even get up the strength and motivation to study? Consider today your lucky day, because this article is about to show you how. And if you’re ready to accelerate your test productivity and cut away at information overload, then all you need to know is a single question – one that we’re about to reveal to you. Can it really be that simple? Yes, it can – and you’re about to experience the pure joy that comes with knowing that your nursing license is practically in your hands right now. Don’t subject yourself to even more pain and misery by avoiding this article. Start to experience the euphoric relief that comes with massive productivity levels and the ability to cut down registered nurse practice overload with just a single question. So how can we make such grand claims that we can eliminate the pain and misery of information overload – not to mention poor productivity – from your life? It’s simple, really: it’s because we’ve uncovered the single concept behind every National Council Licensure Examination Practice Questions. Years of NCLEX-RN preparation research has shown us that the National Council of State Boards of Nursing have continually tested for one main concept on 80% of their exams. And that concept is integrated processes. 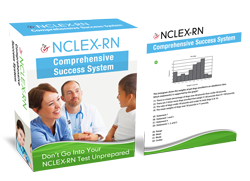 …Because you won’t have to waste hours on unproductive and useless NCLEX-RN review! Every multiple-choice test question is going to focus on an integrated process. Before you look at the answer choice, you need to identify which one. Take out a practice question. Remember, don’t look at the answers. List the five integrated processes next to the question. Remember, that’s communication, documentation, caring, learning and teaching. “Does this question require me to judge outcomes or set priorities? If the former, then you’re being asked to evaluate. If the latter, then you’re being asked to plan. Use this to identify the integrated process. Once you have, you’re already 90% there to the correct answer. When you start using this question on your own test prep, you’ll start to realize that you don’t have to study hundreds of pages of test content. You don’t have to lock yourself away in your study for hours at a time in an attempt to tackle your test content. You don’t even have to review your entire study guide – because this question will give you all the tools you need to up the ante in your test study and productivity. Click here on this blue text to see the FREE prep video at: “Types of NCLEX-RN Practice Tests and Review Guides that Caused Me to Fail the First Time” right now. Watch this video NCLEX preparation video so you master this process BEFORE your upcoming test day.